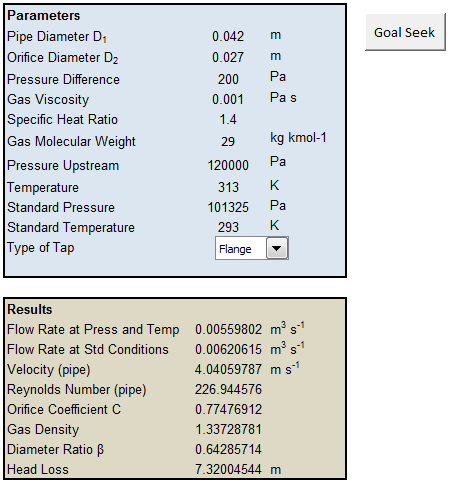 This Excel spreadsheet calculates the flowrate from a small-bore gas orifice meter using the ASME MFC-14M-2001 standard. This calculator is valid for pipe diameters of less than 40 mm (other restrictions are given below). The spreadsheet uses the ideal gas law to calculate the gas density (you just have to supply the molecular weight, pressure and temperature of the gas). Additionally, the discharge coefficients are only valid for the tap configurations illustrated below (as specified by the ASME MFC-14M-2001 standard). You can choose either Corner or Flange taps with a drop-down menu in the spreadsheet, and Excel automatically uses the correct correlation for the discharge coefficient. 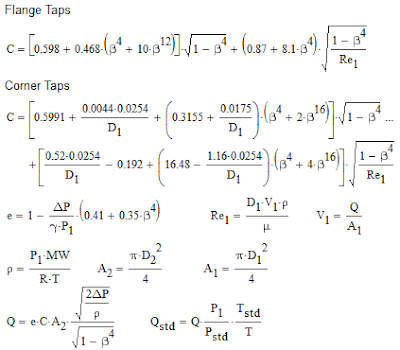 These equations (like nearly all orifice flow meter calculations) require an iterative solution. This is easily done with Excel's Goal Seek. All you have to do is click a button. 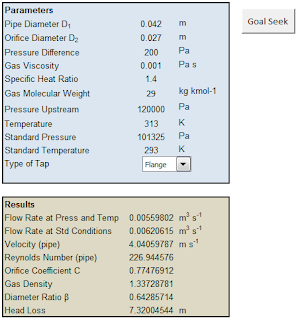 Goal Seek uses an initial guess value for the Reynolds Number to calculate the discharge coefficients, and uses this to calculate the flowrate. The calculated flowrate is then used to calculate the Reynolds Number. Goal Seek then automatically adjusts the guess and calculated values of the Reynolds number until they are the same.